The classic choice during the Easter and Christmas festivities which is available and just as tasty all year round. At John Sheppard Butchers we take great pride in the welfare and quality of the Turkeys we supply to our customers. For the last 30years we have sourced all of our free-range bronze turkeys from the same award-winning family run farm. The sustainability and level of quality of the product coupled with the experience of the producer ensures that the centre piece of your festive meal will be succulent and delicious. Available for pre-order at any time; please state the required delivery date at the checkout stage. No key features selected for the Oven Ready Free-Range Bronze Turkey. No quantity discount for the Oven Ready Free-Range Bronze Turkey. 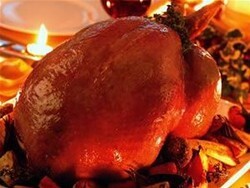 Be the first to submit a review for the Oven Ready Free-Range Bronze Turkey.